I always get asked about which foundations I use, on myself and on photo shoots, we are so lucky now that we have so many to choose from, but it can be confusing when trying to decide on the right one for you. Then there is the task of applying it, do you use fingers, sponges or brushes – we all just want to look flawless, right? mature, exfoliating should be an integral part of your skin care regime. Ok so now your skin has a fresh even texture, your ready for your moisturizer/and or primer. If you have dry skin use both, waiting 30 seconds in between applications. If your skin is very oily then you can use a primer directly onto your skin. But I do recommend you alternate this routine with a lightweight oil free moisturizer. Oily skin can still be dehydrated (lacking water, not oil) this will hydrate your skin in the right places to allow your foundation to sit beautifully, without being greasy. Again wait a minute for your primer/moisturizer to absorb and settle before applying your foundation. foundation in the hairline – yuck! If you want to take it one step further, than you can also go in with a beauty blender. When I first came across the beauty blender I thought it was just a fancy looking expensive sponge – which it kinda is but after a few goes, I was hooked. They have a suede finish and it doesn’t absorb product like a normal makeup sponge does – so wasteful. The beauty blender will lift of any fingerprints or brush marks and is fantastic under the eye – they also make mini ones now for the smaller areas – so cute! attention to the area that your trying to hide. Always conceal after foundation! I like to then go ahead and finish the rest of my makeup before powdering, giving the foundation time to settle, this also allows you to easily clean up any mistakes or ‘fall out’ from eye shadows etc. SMA Tip – if you are doing a Smokey eye or using loose pigments then I would recommend completing your eye makeup first then doing your foundation. This saves you ruining your foundation and not having to clean up fallout! Choosing the right foundation for your skin type is also important, it also depends on the type of finish you want. Great or normal, mature and drier skin types, these can have a high sheen, which personally I love, but you may wish to use powder down the t-zone. I love the Hourglass ‘Illusion’ Tinted Moisturizer – it’s a lot heavier than a tinted Moisturizer, actually more like a liquid foundation. Very reflective, not ideal for bridal as could create to much ‘bounce’. Hyaluronic Filling Spheres to help minimise the appearance of fine lines and wrinkles – so fancy! foundation like MAC’s studio fix liquid. Cream to powder foundations are great for this, apply with a sponge (often provided – make sure you wash at least once a week to avoid bacteria buildup – shampoo is fine) Again Oil free foundations are best – these work best with oily skin. A dewy skin is a modern skin, gone are the days of the 100% matte faces that we saw in the 90’s, I myself was partial to a heavy dusting of Max Factors pressed powder in Transpacncy (was definitely not transparent! que my orange teenage face Lol) Powder can be an essential part of the kit for most girls (and some boys) but using to much can make your face look flat, over made up and it can age you dramatically. Of course pigmented powders have there place – they are fantastic to use alone (without foundation) I love the MAC Mineralize powders for a quick on the go base – just don’t use them with a liquid foundation. Use a smaller brush than you think – try using a small fluffy blending brush and just powder the forehead, nose and chin, leave the cheeks to glow naturally. I love MAC’s #224 brush for this. Texture – Gel like, but goes on the skin like silk.Coverage – medium, but builable if you want more coverage.Finish – SatinSkin Types – All * Great for evening makeup, Brides and on Photo shoots. 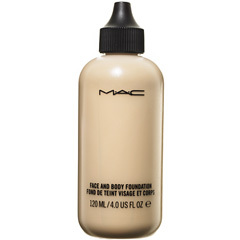 MAC Face and Body – $60Texture – very thin liquid Coverage – Sheer Finish – Dewy Skin types – All *This looks amazing on, if you have great skin, it’s lightweight it feels like a second skin, great for photo shoots, or brides that want a very sheer base. Tip – squeeze a 5 cent coin amount into palms of hands, rub hands together and apply to face like moisturizer, the texture will change as it sets in place! Dior Capture Totale SPF15 – $108Texture – Liquid, goes on really well, absorbs into skin with ease.Coverage – Medium Finish – Natural Satin Skin types – Mature, Dry skin *Great for mature skins, contains moisturizers, skin looks brighter. Texture – silky Liquid – glides on beautifully to the skin! Coverage – Light but buildable coverage Finish – Natural Skin type – All * This truly is a beautiful foundation, great for all skin types, perfect for brides. Texture – cream to powder (use a brush or puff to apply) glides on beautifully Coverage – medium Finish – Semi matteSkin Types – Normal skins. Excellent value for money, this is great for a quick application of touch up, come in a cute package with a mirror – would make an ideal first foundation. Downfall is it only comes in 3 shades!